Trevor came up with an incredible idea of 'Pay It Forward'. He postulated that he helped or did a favour for three people. 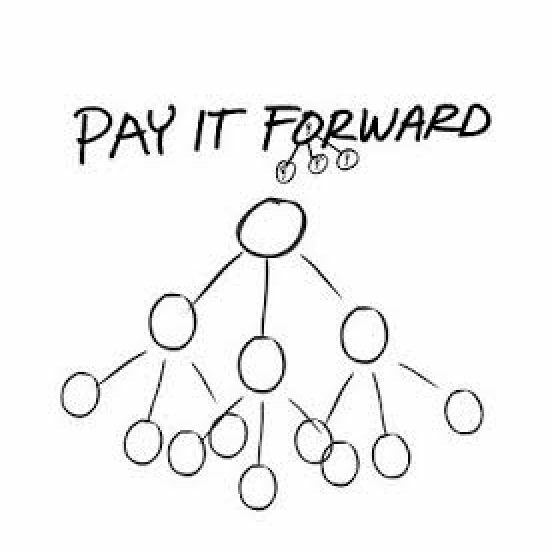 Each of those three people then 'Pay It Forward' to three people. And so on and so on. The basic idea is that the number of people being helped increases threefold with each level of person helping. One person helps three. Those three help nine between them. Those nine help twenty seven between them. And so on. This idea is so simple and yet has the potential to be something quite phenomenal. Selflessly helping people is revolutionary. If it caught on the wave of good feeling would be wonderful. We do not all have cars to give away to strangers. However, we can help an older person with their shopping, pay the shortfall on someone's shopping, get in touch with a relative we have not spoken to for a while. These gestures whether they are large or small can compound to make a significant difference to those we help. If they then did the same. To the world you may be one person but to one person you may be the world. One simple gesture can make a huge difference to someone. If you are giving time to someone then you can do it again and again. Everyone who watched the film must have thought about who they could help. How many actually did though? I try to help people. However, do I do enough? Could I do more? I am going to try to do more. If enough people help others we can make a difference to our community, to those we love, to the world. This could be the beginning of something special. Who is with me? ?